Despite Kevin Cheng’s (鄭嘉穎) continued popularity and pulling strong ratings in Ghetto Justice 2 <怒火街頭 2>, he may have to move aside for Moses Chan (陈豪) in this year’s TVB Best Actor Award race. TVB may have set the stage for Moses’ impending win with several factors playing in his favor. Moses’ next TVB drama, The Last Steep Ascent <天梯> produced by Lee Tim Shing (李添勝) is set to broadcast in September. 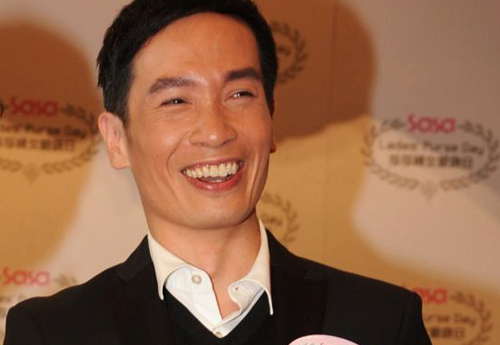 With this drama airing at such an opportune time, Moses Chan has a good chance to become TV King! Even if Moses does not win the TV King award this year, he is already a financial winner. It was estimated conservatively that Moses had already earned $30 million HKD this year from seven commercials, stage events, promotional events held at malls, as well as fees from filming dramas. Recently, Moses earned an additional seven-figure sum from a real estate advertising event. Although he had just finished filming, Moses still looked refreshed while appearing at the function. He entertained the audience with magic tricks and juggled lemons. As an inexperienced drinker, he even participated in wine tasting which caused his face to become extremely flushed. In the last scene, he was required to go into the water. With slim opportunities to go into the water during filming, Moses said that he enjoyed the experience. The Last Steep Ascent also stars Moses’ girlfriend, Aimee Chan (陈茵媺) alongside Maggie Cheung (張可頤), Kenny Wong (黃德斌), Joel Chan (陳山聰), and Edwin Siu (蕭正楠). With such a talented cast, The Last Steep Ascent will sure become the next hot topic for discussion in September! This article is written by Connie for JayneStars.com. Moses for Best Actor???? Noooooooo……. I never thought he was a great actor and despise him for what he did to poor Bernice. The worst is how he and Aimee flaunt their love for each other…arghhhh….. I was set on not watching The Last Steep Ailment but since I just found out that Lee Tim Shing produced it, I might give it a try. I’m rooting for LF to win Best Actor in High and Lows, hopefully I won’t be disappointed by the results. How can Kate be a contender for HAL when LF not? Double standard or TVB love Moses and KC more! Poor Maggie. AimeeMo couple will be put first Puke. Maggie always need to step aside. Everyone knows that Kate is wrongfully thrown in as a contender to spice up the race for Best Actress even though the award will most likely go to Tavia. Kate is nowhere close to winning Best Actress with what I’ve seen so far. She might prove me wrong in High and Lows but I really doubt it. Don’t get me wrong, I like watching her series but she still has a lot to improve on. I feel sorry for Maggie to have to participate in another production with the puke-worthy couple. Puke whenever Moses still described as ‘gentleman’ and puke whenever AimeeMo couple flaunt their love in open air endlessly. Especially after what Moses did to Bernice. Despicable selfish man. When HAL comes out there will have LF’s name for the purpose of promotion. Or they are too busy to find him new girl(s) so forgot that he also had series. Or all of above reasons, lolz. Clearly don’t understand what Moses did to Bernice? I thought all this while it was Bernice who kept him waiting and broke off the relationship. If this is the case, what is wrong with getting a new gf? 4. TVB and 620 did nothing to salvage Bernice’s image as the cheating gold digger. At this time Bernice is still contracted with TVB but her contract is ending soon. Moses said nothing too. 5. After 1-2 months, Bernice come forward in an exclusive interview and disclosed that she was in a major surgery during all the fiasco that doomed her image. She mentioned that she and Moses has broken up since 2008, which denied that she’s cheating on Moses to be a gold digger. Note earlier that Moses didn’t mention anything about this to reporter and he played a sad boyfriend victim card. 6. After that, Bernice left TVB. Meanwhile, Moses and Aimee embark on TVB’s most high profile and open air lovey dovey couple ever. not a fan of bernice, but what moses did (or didn’t do) also disgusted me. am also sick of his romance with aimee. aimee was a budding actress in tvb (i actually liked her) until moses ruined her career by admitting his interest in her and subsequently flaunting their relationship at every opportunity. agree, moses getting boring and old looking. he really looks like amiee brother. he is bum for giving Bernice the bad treatment. Sadly I do agree with you. It’s not about the acting so much now in comparison to the past. None of the TVB awards have anything to do with acting. it’s all marketing. Sadly agree. It’s not about acting. And the fans want their idols to win just in order to have higher salary, lolz. These two again!? I wouldn’t mind repeat favourites if either of them deserved it… sigh. I’m excited to see Highs and Lows and SSSS. Maybe Michael Miu and Damian Lau will come out as contenders? michael n damian r great actors.. tvb r lucky to hve thm..
TVB is very lucky to have them indeed as they are wonderful actors but the spotlight would be on the younger generation siu sungs. TVB is making turns, no need to rush Moses, you may get it who know, maybe in the list from TVB, then it is your turn. I don’t even care who gets it anymore LOLOLOL this award has nothing to do with talent. Okay, I’d rather Kevin Cheng get it a second time than have Moses get it. I never liked Moses’ acting. He IS funny in many dramas, but it’s like he can’t do anything besides being funny. I’d say that I’d be most satisfied if Kenneth gets it this year tho. But he doesn’t have a drama out at the end of the year, besides SSSS (where he is overshadowed by veteran Damian Lau), so I only see hope for THC. Have you watched Master of Play or When Heaven Burns?? Moses can act, but he’s just playing the funny roles a lot, and that’s where people gets annoyed because it’s not THAT funny anymore. LOL I didn’t finish either series, to he honest hahaha. But I just wanted to point out that Moses can play different roles other than just being funny. I know that he played many serious roles, but what I find is that he doesn’t do well with those. He can only play funny imo. Agreed. I only liked him in MR. YSSS got boring for me, cuz his expressions were the same. And I can’t stand seeing him in recent serious dramas such as WHB or MOP. Doesn’t suit him at all. I disagree. I think since Love Bond, Moses’ “funny” act have not been money at all. Particularly HOG and CMBL were horrendous shows. But I think he’s a decent serious actor. If Kevin can get it twice, then surely Moses can too. However, I would much rather prefer someone else take it. If Raymond just perform well in HAL, I could totally see TVB finally giving it to him. I think Moses is better than Kevin in acting but they should have someone who has never won it before. They should have someone deserving that award. I am all for Kent Cheng as best actor. yea, i agree. i would love to see kenneth ma win it this year. he did really well in THC! Too many times. King Maker also not heavily promoted sort. Personally why not Kent Cheng eh? The King Maker is really good and exciting. But as of now, Kent is better in it than Wayne. Pierre Ngo should have a high chance at best supporting actor! Funn, if Kent Cheng is in the running then Moses and Kevin can’t win. TVB logic is pretty simple. Wayne Lai, Raymond Wong, not Moses Chan or Kevin Cheng. I feel Bosco should be in consideration. I hate all of Moses series this year. I can’t remember one series I didn’t find him overacting and overly annoying in the past 3 years. Just my opinion. fully agree with aw on moses series none are good. I still stand, they should have cast Raymond Wong instead of Moses Chan for The Last Steep Aliment. First of all, Raymond looks more 5 years younger than Maggie, as their characters in the story. Moses looks older than Maggie. Second, Raymond is a better actor, and especially good in the romance department…much more convincing and sympathetic than Moses. Third, Raymond doesn’t have the baggage (read: Aimee Chan) like Moses. And lastly, Raymond is way hotter than Moses. What’s wrong, Tim Gor?! Why didn’t you cast Raymond? Hell, Bosco would be a better choice than Moses too. I guess it is Maggie Cheung who would save the show. LOL agreed. I think Raymond Wong, Bosco or LF can be more convincing and produce better acting than Moses LOL. Best Actor Ron? When he tried to deny knowing the girls of his affairs, in the next few seconds he got busted already when reporters pressure him a little bit. Like I would buy his acting. lol I don’t think he deserves the best actor awards yet, but if it is an awards as a couple, then I think he and Kate. But that’s only my oppinion though. i was wondering the same, why are they just mention Kevin and Moses, what about Kenneth? Moses’ “The Last Steep Ailment” will likely be a big hit, given that audiences seem to like producer Lee Tim Shing’s recent series. Kevin’s “Ghetto Justice 2” has become a juggernaut in ratings since the Olympics ended. Once “Silver Spoon, Sterling Shackles” airs, Kenneth will be added to mix. Really wonder who will be in Top 5 this year… I think Kenneth very much deserves a spot, as this year is a breakthrough year for both his acting performances and media exposure. Yeah that’s true, GJ2 has been going really up after that Olympic ended. Wonder if it will be nr 1 and beat WI in TVB list of 2012. Well let’s hope he get in top 5 st least. That would also be good. I don’t really enjoy any of the dramas with the cast involving Moses Chan, Aimee Chan, Kenny Wong, etc. These people are always in the same drama now, it’s like they’re a group. I’m sure Kenneth will get a nominee spot for this achievements this year. But it’s rather doubtful that he’ll get the actually award already. @sure-lee: I agree with you completely. This “group” really gets boring. Moses n Aimee again nooooooooooo…might give it a miss even tho i like Maggie. Kenneth Ma should win the TV King this year though and tavia the TV Queen. Riots! Lame! Undeserved! Unfair! Txb sucked! Lolz =)). Certainly, why not Kevin again this year to win the award. I find that he and Myolie give such mature and solid performances in GJ2 and like them even more here. LOL Myolie in GJ2 was just being Myolie. I saw the same Myolie in interviews in what I saw in GJ2 and this time KC and Myolie tried too hard. I’m mad that they cut Sam Lee and Jazz screentime to focus on that boring triangle. GJ1 was good because of the writing for the characters especially the four friends but GJ2 fell so bad! I agree that the awards are often used for marketing purposes but it’s unfair to say that’s the only factor. Excluding last year, 2010, 2009, 2008, and 2007 saw Wayne Lai, Sheren Tang, Ha Yu, Michelle Yim, and Louise Lee win. I believe none of them are TVB managed artists when they won and none of them are now either. If there is a breakthrough performance by an artist, TVB really has no choice but to award them. Last year didn’t have any breakthrough performances and so it went to who TVB thought was most deserving and marketable. I think it will be the same situation this year as well. The award means as much as the winner thinks it means. I’m sure the winners are aware of why they won it. Talent or marketability, they can decide for themselves. Bosco deserve to be running instead of Moses. He was great and showed another side of him as Hui Sir. I don’t think Moses was suitable for his roles in WHB and MOP. Ruco Chan would’ve made a better and more melancholic serial killer and had always been a better actor than Moses. This award now is about favouritism and never about acting anymore. TVB is losing credibility. I agree. Bosco has being showing a lot of sides by him, he can play many roles really good, I also think that Bosco deserves this awards, but that’s my though. I think he does deserve them. I hate it when they cast a certain actor in like 4 or 5 series just to make their chances of winning higher. It’s just not fair to other actors who only get 1 really crappy role. When is TVB ever fair? pleasing themselves. For me, i just want entertainment. Movies and nothing else. Well, Louis Koo won Best Actor in 1999 for DIF4 & 2001 for ASITP and he derserved them, unlike these new actors nowadays. Louis, please come back!!! Why Kenneth Ma ,Wayne Lai ,Ken Cheng ,Joe Ma ,Michael Mui not nominated ? Kenneth have started in 3 kingdom ,on call 36 hours ,tiger cub ,why he never mention? and most of Moses TV serial this years are very bad . Moses is overrated. I never think of him as a good actor. Surprised to know that Moses is also in the run for the TVB Awards this year. Thought Kenneth was highly favoured and I agree. Why is Moses in the run when his peformance isn’t up yet? This is unfair. Based on what I watched only Bosco(WI) and Kenneth(THC) are eligible so far. Kevin was more interesting and refreshing in the first GJ. I also heard Wayne is good in King Maker, but I haven’t watched yet. I thot maggie signed with cti? Or she did this b4 she left tvb? She filmed this right before she left. Not sure how well Moses have done in The Last Steep Ailment but I am fairly sure his character from Master of Play won’t be able to beat Kevin’s Law Ba. As much as i like to see maggie cheung and moses again after WAB, i am disgusted when Moses ‘recommended’ aimee into the cast of the drama. I mean, come on, work is work! many people do not think that Ken C could win TV king award this time. the series2 is worst than the 1st one, Myoli Wu and Ken overacted and not natural, i think TVB has bought too many awards for them until they have swollen heads. I’m hoping that Raymond Lam could win TV King although his chances are least. Why is that pessimistic? But actually does he need this award? Just one to add in his long award list, not important. Bosco and Adam cheng for the best acting award! Ken ma for best character award! Lam Fung for best TVB singer award!